Kurdan's Hunters are the three inhabitants of Fort Grief during the Caught in the Hunt quest. They have paid Kurdan gro-Dragol to come to the ruined fort and enjoy the thrill of the ultimate hunt--humanoid prey--and must be defeated in order to escape the dungeon. All three hold some gold and carry a key that grants access to the next stage of the dungeon. Among the treasure they drop is a leveled healing potion (weak from level 1-4, standard from 5-8 and strong at 9+), but this only appears at the moment of their death and so cannot be picked from their pockets. None of them ever sleep or eat, simply wandering their areas of the dungeon all day and night waiting for their prey to arrive. They will all fight to the death, refusing to accept yields. None of the three know any spells. After you find Aleron Loche during the related quest, he will reveal that Kurdan has tricked you into becoming prey for the hunters, just as he was. You can ask him about the hunt, and he will reveal the truth about Kurdan: "Kurdan doesn't make most of his money being a simple usurer. He also invented what he calls the Hunter's Run. People pay him a great deal of money to hunt and kill living human prey. No questions asked, and he takes care of the bodies." When you mention that you could simply leave on your boat, Aleron will also tell you that the only way to escape Fort Grief is to join the hunt and defeat the hunters: "Don't bother. The door to this place is now locked. The only way to get out is by decending [sic] into the Hunter's Run and killing the Hunters. One of them will have the key to the door. That's Kurdan's rules. It's the only way we can win." Once you have defeated the hunters and Kurdan makes his appearance on Fort Grief, he will briefly mention the slain hunters and suggest that they will soon be replaced: "I'm impressed that you killed all my clients. Doesn't matter. More will come along with their purses fat with gold and hearts lustin' for blood." 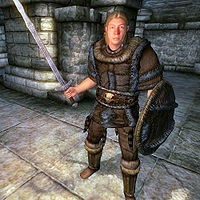 Kurdan's Imperial Hunter wears leveled light armor. He will always wear a cuirass, greaves and pair of boots, has a 75% chance of wearing gauntlets and a 25% chance of a helmet but never carries a shield. His weapon is a leveled shortsword. None of his equipment is ever enchanted. Beneath his armor he wears lower-class shoes and trousers, and he also carries the First Hunter's Run Key. 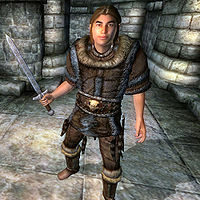 Kurdan's Nord Hunter also wears leveled light armor. He will always wear a cuirass, greaves, pair of boots and carry a shield, has a 75% chance of wearing gauntlets and a 50% chance of a helmet. His weapon is a leveled longsword. None of his equipment is ever enchanted. Beneath his armor he wears lower-class shoes and trousers, and he also carries the Second Hunter's Run Key. 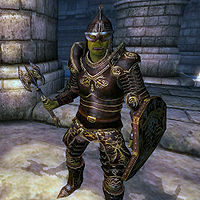 Kurdan's Orc Hunter wears leveled heavy armor. He will always be holding a shield and wearing a cuirass, greaves and pair of boots, and may also be wearing a helmet and pair of gauntlets (75% chance each). He wields a leveled mace as his weapon. None of his equipment is ever enchanted. Beneath his armor he wears middle-class shoes and trousers, and the last item of interest in his inventory is the Fort Grief Door Key. This page was last modified on 25 March 2018, at 02:59.